www.boscombedownaviationcollection.co.uk Based at Old Sarum airfield not far from Boscombe Down, this is a wonderful place to spend a few hours. You can sit in the cockpit of many different iconic planes and get a real feel of what being a pilot entails. ARAC are pleased to have joined forces with them and are in the process of setting up a working Radio room on site ! www.rsgb.org The Radio Society of Great Britain (RSGB) is the national membership organisation for Amateur Radio enthusiasts. The society was first founded in 1913 and incorporated in 1926.Our patron is HRH Prince Philip, Duke of Edinburgh, KG, KT. www.ofcom.org.uk Ofcom was established as a body corporate by the Office of Communications Act 2002. Ofcom is the regulator for the UK communications industries, with responsibilities across television, radio, telecommunications and wireless communications services. www.themorsecrusade.g5fz.co.uk The aim of the Morse Crusade is to Educate Morse Trainers in the benefits of using methods of teaching Morse that WORKS! www.fists.co.uk FISTS supports the use, preservation and education of Morse code. The club is devoted exclusively to CW operators, CW operating and people who are passionate about Morse code. Andover Radio Amateur Club are affiliated to FISTS. Highfields Amateur Radio Club - Radio Club located in North Cardiff, Wales. There is a plethora of technical information on this website. 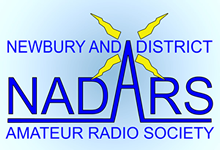 www.nadars.org.uk Newbury and District Amateur Radio Society - Radio Club located in Newbury, Berkshire. They hold rally / boot sales regularly - visit their site for details. www.hdarc.co.uk Hordean and District Amateur Radio Society - Radio club located in Waterlooville, Hampshire. Their website has many useful links and other information. www.southgatearc.org Southgate (and Finchley) Amateur Radio Club - Radio Club located in North London. Their website offers an array of information, both technical and entertaining. www.nationalhamfest.org.uk National Hamfest 2013, hosted by Lincoln Short Wave Club and sponsored by the RSGB - September 27th and 28th 2013. Website that produces a regular podcast specifically for Amateur Radio giving the latest news, views and feedback. You can download the latest edition and listen to it on your PC or any portable media player.